Since I realize there’s a bunch of not-german-speaking people out there willing to learn something about using the Boss FC-50 with Ableton Live as a loop station, I decided to translate my ariticle into awful english. tomauger.com already did half of the work – thanks for this! But still there is a little difference in how we wanted things to work. My aim was to use only one single footswitch for one single loop-track. Most approaches (also tomauger’s) required to use at least two footswitches for one track: The first for recording, the second for playing back the loop. Maybe also a third one to delete the scene. (If you want to loop a midi track you have to use even a fourth one in order to aim the track for playing). One could also try to use two other footswitches in order to select next/last scene/track. But all that means: You have to use a lot of footswitches everytime you want to loop a single track. It gets complicated, and thats not only uncomfortable but also dangerous in a live situation! With the 6 pedals of my Boss I’m now able to control 10 (!) tracks. If you then press FS 2/7 by default it sends PC #2. So far so good. If you then press the Bank Switcher (A/B) to switch to the higher bank (6-10), it will send PC #7, because FS 2/7 was last pressed and now that we’re in Bank B, FS2/7 sends PC #7. If you then press FS 1/6, it sends PC #6, as one would expect. This is a pain in the arse. Yes, it definitely is. But with my approach this doesn’t lead to show-stop because using the Bank Switcher will cause nothing more than aiming a specific track in Ableton: For example, if you press FS1/6, Track 1 will be aimed. If you then press the Bank Switcher, Track 6 will be aimed. And so on. Important: Use capital letters! You can also use my Ableton file. You don’t have to make more midi configuration in Ableton, but in Bome’s Midi Translator (if you didn’t do that before). 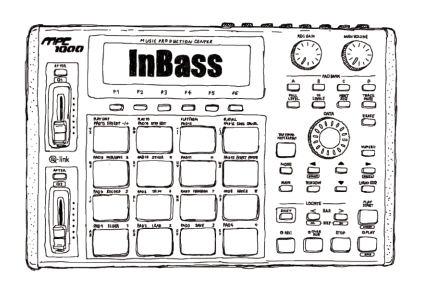 In the menu, select the midi-in you hooked up your FC-50. 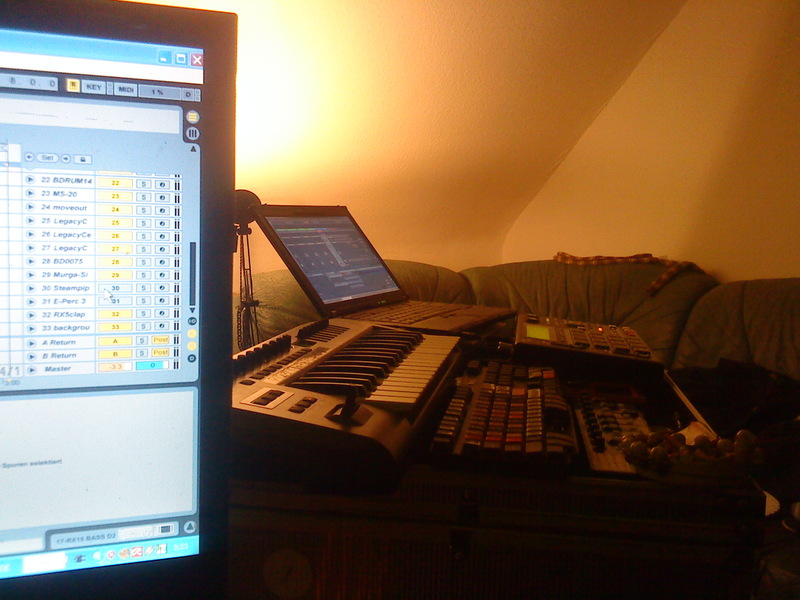 Midi-Out is of none importance since we want to send keyboard commands to ableton. Now things should work: Switch to Ableton and trigger footswitch 1. Track 1 will be aimed for recording. If you trigger the same Footswitch again, it will start recording on track 1. Trigger one more time and recording will stop and play the recorded sound in loop. Your Boss might be connected badly. In Bome’s Midi-Translator a light is blinking down to the left if the program is recieving Midi data. You pedal doesn’t support program-change commands or it’s sending other ones than the fc-50 does. Then you have to start editing my Midi-Translator script. You didn’t use CAPITAL LETTERS in Ableton. …or caps is activated on your keyboard. So what’s the big deal about this script? How does it work? The problem with Bome’s Midi-Translator is, that only one specific keyboard action (or string) can be assigned to one specific midi signal. The program doesn’t understand that a footswitch was already triggered before (e.g. for aiming a track) and that we now want him to execute another command if the switch will be triggered again (e.g. for recording the loop). The solution can be found in Midi-Translator itself. With the software you’re not only able to execute keyboard commands, but also preset changes. With this feature it is possible to assign to a footswitch BOTH a keyboard-command AND a Bome’s-internal preset switch (or change) . In this now activated preset, the footswitch is assigned to other commands than in the preset which was active before. The commands of the other footswitches will remain the same in this preset. This you have to do for ALL the footswitches on EVERY step (aim, rec, play, del). The script will get really confusing with increasing tracknumber, number of switches and numner of steps. So everyone who wants to f*** up his brain, feel free to take a look into the script and edit it ad libitum! I look forward to see something of your approaches! hier endlich die Video-Playlist des Auftritts im WP8 letzten Juli. Leider lassen sich bei wordpress.com keine Playlist einbetten, so dass ich an dieser Stelle nur auf den Link verweisen kann. CDM berichtet schon seit einiger Zeit von einem neuen Controller, der von Akai in Kooperation mit Ableton entwickelt wird. Besonders auf der diesjährigen NAMM hat das Gerät für Aufmerksamkeit gesorgt. Zurecht, wie ich finde! Die Meldungen erreichten mich, als ich selbst gerade eine Lösung für Clipsteuerung in Ableton suchte. Das APC40 solle sich problemlos in Ableton einbinden lassen da es bestimmte CC-Commands nutze die es erlauben, ohne Treiber oder nervigen Einstellungen sofort loszulegen. Gerade der Umstand, dass die einzelnen Tasten durch leuchten anzeigen, welche Clips gerade aktiv sind und die Möglichkeit, mehrfachbelegungen von Fadern und Potis vorzunehmen, lässt mich an ein sehr intuitives Gerät denken. Aber 449 € ??? Das ist schon etwas SEHR viel für meinen Geldbeutel. Und das für ein paar Knöpfe? Ich selbst besitze mit dem Foot-Pedal, der MPC, meinem Midi-Keyboard und einem Gamepad schon genügend Kontroll-Möglichkeiten. Das einzige, was mir noch gefehlt hat, war eine Möglichkeit, schnell und intuitiv Clips zu starten zu muten und zu stoppen, auch z.B. Loops, die ich mit dem Fußpedal aufgenommen habe. Ich habe nachgedacht und mir eine Dell-Tastatur für 3 € bei Ebay ersteigert und die Tasten farbig angsprüht. Jetzt habe ich für Ableton auch einen Clip-starter – und das für 10 anstatt 8 Kanäle. Inklusive Mute-, Stop-, Rec-Aim-, und Effect-Buttons. Natürlich blinken die Tasten nicht und ich kann für jeden Kanal auch nur jeweils einen Clip starten, aber für Live-Performances ist das schon angenehmer, als mit der Maus zu klicken. Und 449 € zu latzen.